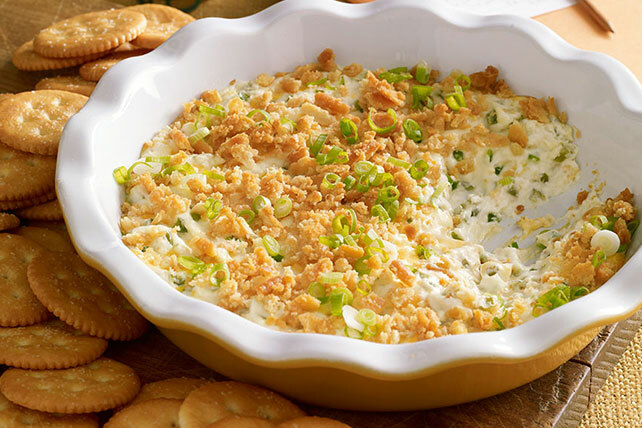 Enjoy the flavor of a creamy, cheesy dip in every scoop of this Kickoff Pepper Dip. This pepper dip is topped with a sprinkling of butter cracker crumbs. Beat cream cheese and mayo in medium bowl until blended. Stir in VELVEETA and peppers; spread onto bottom of 9-inch pie plate sprayed with cooking spray. Top with combined cracker crumbs and butter. Serve with additional RITZ Crackers. Prepare using 1 tub (8 oz.) PHILADELPHIA Bacon Cream Cheese Spread.